Netflix, buoyed by its success in the Canadian streaming market, intends to expand its international streaming services in 2011. Netflix entered the Canadian streaming market in September, and spokesman Steve Swasey told CBC News that the company would very likely break even finiancially by next September, a very short time in which to become profitable. Based on this success, Swasey says the company is looking to branch out into other international markets in 2011. He was vague regarding specific countries, or even continents; his exact words, as quoted by CBC, were, "based on the early success of Netflix.ca we're going to continue our international expansion next year and we're going to allocate significant dollars to it." Netflix's streaming services in Canada have gone over well, despite some misunderstandings and weird omissions in service. According to CBC, Swasey says many Canadian customers expected Netflix to provide streaming access to many new releases, and complained, "where's my Avatar or It's Complicated," about which Swasey notes, "we've had to do a little bit of resetting of expectations." Netflix's solution is to be more proactive with marketing new titles when they're available to stream. 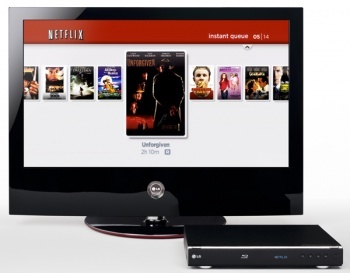 Another complaint is that there is no way to set up a queue of streaming films, known as an "Instant Queue" in the U.S. Bizarrely, Netflix has no intention of adding this feature to its Canadian streaming service. My stupid computer kept recognizing my U.S. presence, and kept redirecting me away from the Netflix.ca site, so I couldn't observe this weirdness first-hand.